The Choral Society's next concert will be on the evenings of Friday 3rd and Saturday 4th February at 7.30 pm, in Ratby Parish Church. The Choir will be singing pieces from some of the great composers - Beethoven, Haydn, Mozart, Schubert, Mendelssohn, Rossini – rightly described as 'The Masters'. Many years after their deaths their compositions are still regularly performed at concert halls throughout the world. The Choir will be accompanied by an accomplished Orchestra. Professional soprano soloist Bethan Williams and flautist Joanna Kirkwood will also be featured along with accomplished soloists from the Choral Society. The concert promises to be a very memorable event for Choir and audience alike. Tickets are priced at £10 (£5 for children), including glass of wine or soft drink, and will be available online at www.ticketsource.co.uk/event/155051 (no booking fee), or via a link on the Choral Society's Facebook page. 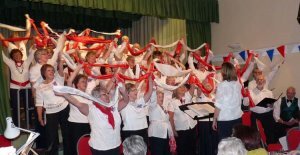 Alternatively they may be purchased at Ratby Post Office, Newtown Linford Village Stores, from Peter/Iris Sayer 01530 243822, or from any member of the Choir. HTML5 validated. WCAG compliant. Page generated in 0.9743 seconds.